The last weekend was a busy one for the club with members involved in races across the country. Result of the weekend goes to Emma Pick who was first lady home at the Fradley 10k in a new personal best time of 39.18 mins. Congratulations to Emma for triumphing in difficult weather conditions. Also competing were Wendy Bowyer and Vickie Gilks who both finished in 1:14 hrs. Dave Fern was the solitary club representative at the Stafford 20 mile race finishing in a very respectable 3:07 hrs. Martin Hollamby and Mike Shelton took on a different sort of challenge at the weekend’s Grizzly ultra race, a 20 mile route across difficult terrain in the Axe valley in Devon. Martin finished 78th out of almost 1,600 finishers in a very fast time of 2:52 hrs with Mike crossing the line in 3:44 hrs. Their times are all the more impressive given that they stopped off for a beer at a pub en route! 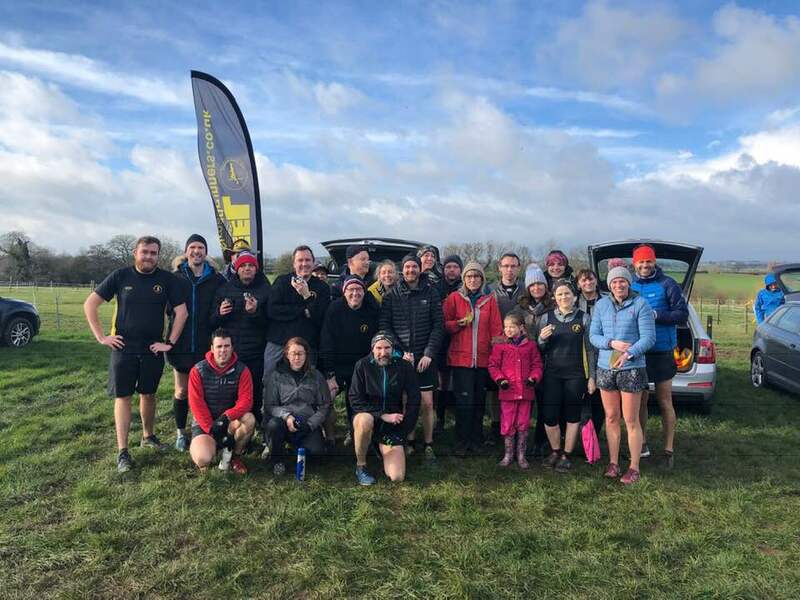 Sunday found a large contingent of club members at the Final Derbyshire league cross country event of the season at Sinai park in Burton on Trent. The course was a challenging and hilly 5 mile route made more difficult by the weather conditions which turned the entire course into a sea of mud. In the men’s competition Rob Mace was first home for the club in 5th overall. He was followed by Lee Rickard (19th), Matt Shaw (48th), Richard Finnegan (54th), Mark Boffey (62nd), Craig Strong (66th), Garth Cox (69th) and Simon Gordon (73rd). In the ladies race, Rachel Casey was first home in 25th place followed by Sophie Galloway (31st), Sandra Ingram (37th), Jackie Tierney (41st) and Val Lawson (51st). After the race runners decamped to the warmer surroundings of the Marston’s social club for the prize giving. Congratulations also to Val Lawson for finishing second overall in the ladies over 55 category across the series of 5 races and Judith Matthews who was third in the ladies over 45 category. Thanks also go to other club members who turned out to support the club despite not running. In particular Ray Rogers for driving runners to the event and his enthusiastic support on the course, Lisa Fletcher for co-ordinating at the finish ably assisted by Rachel Casey’s daughters Darcey and Tommy, and Jo Insley and Emma Livingstone who ran the 18 miles from Tamworth in the rain to offer support. Both are training for the London Marathon. We took pity on them and gave them a lift home! Saturday had a good club turnout for the Kingsbury water park run, despite the unsettled conditions. First home for the club was Rob Mace in 22nd place overall in a fast 20.14 mins on his 99th parkrun. He was followed by Mark Webster (22.17), Mark Boffey (24.26), Allan Williams (24.33), Simon Gordon (24.45) and Marcus Fairburn in 25.56 mins. Natalie Walker was the first lady home for the club in 25.58 mins followed by Sandra Ingram (26.59), Tim Mudd (27.49), Sophie Galloway (29.29), Jackie Tierney (29.35), Christine Norris (38.27), Alison Dolphin (38.28), Nicola Bannister and Ann Hill (both 38.29) and Sarah French (38.30). As it was Christine’s 50th parkrun she and friends were dressed as fairies! Elsewhere Andrew Pickard completed the Barnsley parkrun in 24.25 mins. The club is pleased to announce that it is running a further couch to 5k course, starting on the 16th April at 6.30pm at the Snowdome. The course is aimed at beginners and will last for 9 weeks and you will need to commit to running 3 times a week. Each session will be led by our qualified coaches and last around 30 minutes including a warm up and warm down. During our first session we will provide an introduction to the course and provide an opportunity to ask questions. The course is open to all abilities and ages from 12+, although anyone under the age of 16 will need to be accompanied by a parent or guardian. It is also open to runners who may have attended a couch to 5k course previously. We are able to offer the course free of charge, with the support of Tamworth council. Please see the club’s website or Facebook page for more details and to register your interest.